Lena’s been to the very edge. She’s questioned love and the life-changing and agonising choices that come with it. She’s made her decision. But can she survive the consequences? 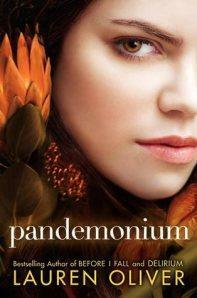 PANDEMONIUM is the explosive sequel to the critically acclaimed and bestselling DELIRIUM. I read Lauren Oliver’s first book in this series, Delirium pre-blogging days, so unfortunately there isn’t a review for it, yet I can’t believe I am only getting round to the follow up now. For anyone ignorant of this series, it is set in a future dystopian world where falling in love is forbidden and highly discouraged, and when children come of age they are subjected to traumatic brain surgery to remove any emotions connected with it, pronouncing it a “cure,” and in effect, producing a nation of zombies. In the first novel, we meet our heroine Lena, who is about to come of age and have surgery, however just in time she meets a young man called Alex and falls head over heels in love with him. Doh! As the second book opens, Lena is being looked after by a group of people in The Wilds, and believes Alex is dead after narrowly cheating it herself. Surviving on the outside of the city walls is quite a primitive process, and the group have to build and construct a lot of necessary materials themselves, and either scavenge for food and supplies or rely on the generosity of sympathisers on the inside for transportation of goods. I enjoyed the way in which the author split up the narrative into “Then” and “Now” portions. “Then” talks about Lena’s life just after she arrived in The Wilds, and “Now” is set in New York where Lena has become an active member of the resistance against DFA (Deliria-Free-America). Lena is attending the DFA meetings posing in disguise as one of the “cureds” with instructions to get close to the founders son Julian, the poster-boy and beacon of hope for the future. But when Julian is kidnapped and things start to go badly wrong for Lena also, she learns a whole lot about trust, strength, bravery and the deliria of love. So, in my opinion, Delirium is the strongest book of the series so far, but that’s not to say I didn’t enjoy Pandemonium. It’s definitely action-packed, exciting and still intriguing enough to keep you reading on, wondering exactly what’s happening to a character that so far you’ve invested a lot of time in. There are still some little twists and turns in the plot also that I didn’t see coming and welcomed whole-heartedly and if you like your endings with a cliffhanger, you’ll probably be a happy bunny with this one! As for character development, I think Lena really matures as an individual through what she has to deal with, and gains both physical and mental strength through her challenges. Julian I’m not so sure about just yet, maybe he’ll grow on me… but saying that I did sympathise with his back story and the difficulties in his relationship with his father. Hopefully I won’t wait too long before reading the conclusion to the series – Requiem, I am looking forward to where the author takes it next and wonder if a happy ending is completely out of the question?